In the very dawn of gaming there was an issue that couldn’t be ignored in that, while you could have a good number of sprites on screen at once, only a few of them could actually do anything. Sure, Space Invaders had 55 enemies, four protective shields, a player ship, and a handful of bullets wiggling their way down the screen, but the wave moved as one and you could see the update rippling across the rows of invaders as they marched back and forth. Super Crome is a classic-styled wave-based arcade shooter that answers the question of what would happen if the graphic limitations of the time didn’t effect the number of sprites moving at once. The answer, of course, is a screen that gets packed full of enemies and bullet swarms as each new wave intensifies, introducing new enemies with new attack patters to interfere with the tactics you’ve been using for survival up to that point, slowly ratcheting up the pressure until the last life is gone. The gameplay is about as simple as a shooter can be, with a few wrinkles to keep things interesting. Your ship fires a single rapid-fire shot to begin with, and Wave 1 is little more than a collection of weak yellow enemies firing a few bullets. In addition to the fire button you’ve also got a dash, which zips you in the direction you’re moving while safely avoiding enemies and bullets, plus a slowdown button for careful movement when firepower is a little too hectic for the standard speed. Enemies take a good amount of hits to go down, soaking up your attack while returning fire, but sometimes they drop a pixel glowing red, green, or white when defeated. The pixel just hangs out where it’s dropped while you hold down the auto-fire, but let go and it instantly starts homing towards you, filling a tiny amount of the color-coded weapon gauge on absorption. The little ship comes with three different limited-use weapons in the form of a charge shot, option-style helpers, and an exploding shot that releases homing lasers. They’re all useful in any situation, but the pickups don’t fill the gauge up any too quickly so you’ll need to be stingy to avoid being caught with the weapon gauge run dry. The pixels also go towards powering up your main gun, and while it takes a good amount of them to earn more firepower it’s absolutely worth it when the power kicks in. In addition to faster shots and eventually a spread gun the power-up adds homing lasers to the dash move, turning what had been an escape into another form of offense. It’s a nice variety of skills that still manages to be simple to use, but the aliens are still going to overwhelm you with sheer numbers. While Super Crome will add a story mode as development continues, right now the only option is an Endless mode that gets meaner and more dangerous the further in you go. 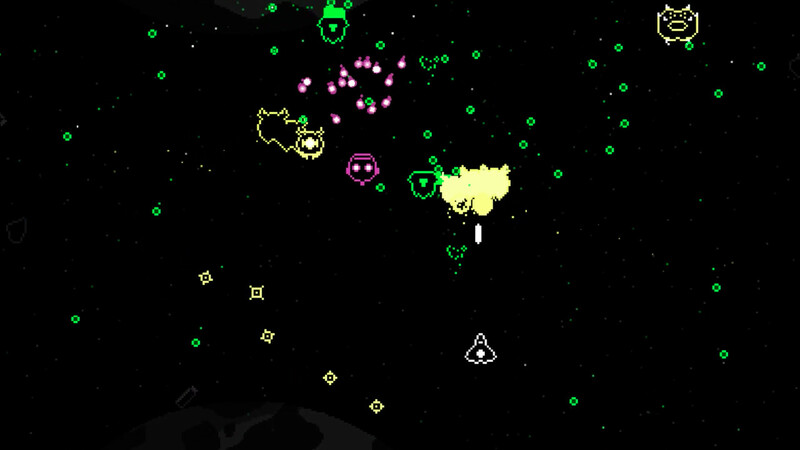 The little yellow enemies are joined by purple jellyfish that heal any alien in its radius, caterpillars crawl across the sky and shooting the head lets loose a spread of bullets, space-squid fire bullet-lines while space ghosts toss up bullet-fans, and weird green whatsits let loose pulsing rays of firepower. By the time you’re at level 16 or so each new wave is a combination of multiple enemy types, all of which let loose their attacks together, and getting through the barrage requires balancing careful movement against a need for fast destruction. You can only clear the screen so quickly when multiple bullet patterns are all trying to kill you at once, and that’s doubly true for the boss fights. As an Early Access title, though, there’s still a lot to come. Super Crome has already received one updates since releasing earlier today, adding a reset function for when a run starts out badly plus doubling the number of pixel pickups. The previously-mentioned story mode will pop up in the unannounced future, while player feedback, new enemies, and other quality-of-life updates (like a pause button!) fill in the development time between now and a full release. It’s also worth noting that Super Crome is starting off cheap before switching to full price on release, but at $1.99 in Early Access it’s hard to imagine the final price tag being too tough on the budget. On the other hand it’s already a good time blasting through the alien swarm, and the high score spot on the leaderboards isn’t too hard to take this quickly after release. Although at the time of this writing I’m at the #2 spot, and need to do something about that immediately.